London : The world's lightest mechanical watch revealed is a key step forward into the development of more widespread applications of graphene, officials at the University of Manchester said. Graphene, first isolated in 2004 by Nobel-winning scientists at the university, is just an atom thick, and is expected to revolutionise the automotive and aerospace industries. The watch was unveiled Monday in Geneva, Xinhua news agency reported. In a statement issued in Manchester, the university said the watch was a unique collaboration with watchmaking brand Richard Mille and racing team, McLaren F1 to create world's lightest mechanical chronograph by pairing leading graphene research with precision engineering. A spokesman at the university said: "The RM 50-03 watch is made using a unique composite incorporating graphene to manufacture a strong but lightweight new case to house the delicate watch mechanism." "The graphene composite known as Graph TPT weighs less than previous similar materials used in watchmaking." 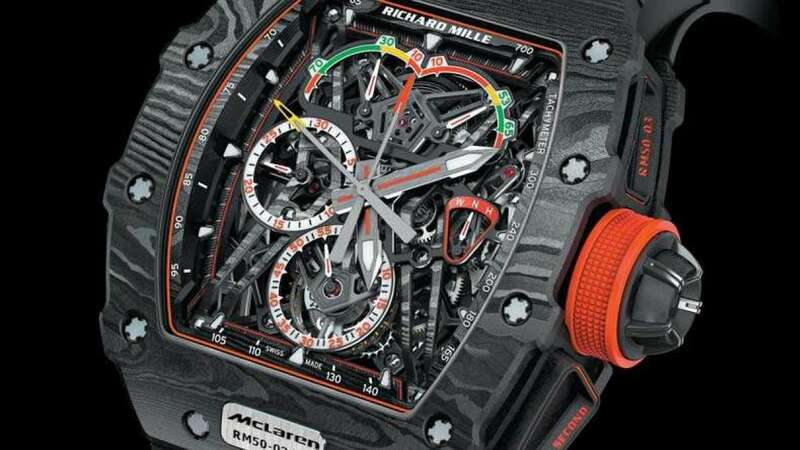 The strap of the watch has also been improved by the addition of graphene material. The rubber of the strap was also injected with graphene which has shown to improve its mechanical properties and its resistance to wear. Overall the ultralight watch weighs just 40 grams. Professor Robert Young from the University of Manchester said: "The striking watch has been precisely designed and inspired by the wishbone suspension structure of a McLaren-Honda Formula 1 car. Combining the design and materials the casing of the watch has withstood tremendous shock damage and survived unscathed in tests."